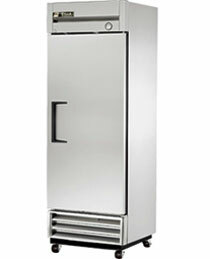 The T-19 reach-in refrigerator is a good space saver, being only 24-1/2 inches deep. Stainless steel door comes hinged right. Includes 3 adjustable coated shelves. Easy to clean white aluminum interior. Stainless steel floor. Positive seal self-closing door with lifetime guaranteed door hinges. Exterior temperature display. Oversized and balanced, environmentally friendly refrigeration system. Door locks. 2-1/2 inch castors. R290 Hydrocarbon refrigerant. ENERGY STAR certified. cULus, UL EPH Classified. Made in America. True Manufacturing has been an industry leader for more than 70 years, and is recognized as the leading manufacturer of commercial refrigerators and freezers in the world. Made in the U.S.A..